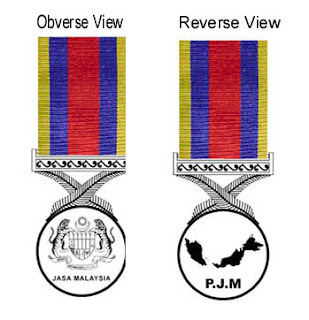 In 2006 the Malaysian Government introduced a new medal, known as the Pingat Jasa Malaysia for British veterans and others who served in operations in Malaya/Malaysia between August 1957 and August 1966. I’m trying to help a friend (RFM Norman McNeill of the Royal Ulster Rifles) who is technically (*cough*) not very up with the internet and wasn’t able to find out the relevant contact details and procedure. It’s not easy because the MoD refuse to recognise the award and palm veterans off to voluntary service groups who then in turn have to deal with the Embassy. I’ve done all that bit though now. As you can imagine, with tens of thousands of veterans applying all at the same time the volunteers are completely snowed under and applications are taking on average a year to be processed. Has anyone out there had similar experiences with the PJM? Can anyone offer any advice about how to complete the process as smoothly and quickly as possible, and, just as importantly, has anyone else complained to the authorities about this shambles, because I sure as anything am going to when this is all sorted out.